Grand Theft Auto V (also known as GTA V or GTA 5) is a video game created by Rockstar Games and is the fifteenth installment in the Grand Theft Auto series of games. The game is also linked with Grand Theft Auto Online, a game released in October 2013 that takes place in the same setting but shortly before the events of GTA V.
The game is set in modern day Los Santos and Blaine County, San Andreas and its surrounding countryside. Although it was originally going to be released in spring 2013, this was delayed with the PlayStation 3 and Xbox 360 versions being released on September 17th, 2013. The game is part of the HD Universe, a fictional universe that connects the storylines of GTA IV, The Lost and Damned, The Ballad of Gay Tony and Grand Theft Auto: Chinatown Wars with those of GTA V and GTA Online. For full details on the announcement, buildup, hype and leaks of GTA V, see History of GTA V.
Grand Theft Auto V features three playable protagonists, a first for the GTA series: Michael De Santa, Franklin Clinton and Trevor Philips, with the player able to swap between the three when not on certain missions or wanted by the police. Certain missions involve two or all three protagonists, allowing the player to switch between them to assist in completing the mission. One mission also allows the player to swap to Chop, a Rottweiler dog owned by Lamar Davis but looked after by Franklin. The three protagonists have their own lives and, when not chosen, continue with their daily routines, occasionally resulting in the player continuing the activity. When the player chooses another character, the protagonist "left behind" remains in his location for a short period of time; if the newly controller character returns to the location where the other character was left, the two will interact and can optionally take part in non-mission activities together. Some storyline missions, side missions and hobbies will only be available to a specific character while random encounters can be encountered and completed by any protagonist. The player can also customise each character beyond their initial appearance through buying clothes, changing hairstyles, getting tattoos and enhancing certain abilities such as stamina, driving skill or flying skill. Each protagonist also has a special ability, which can be triggered during gameplay: Michael can slow down time while on foot, Franklin can slow down time while driving and Trevor can become angry, dealing out more damage and taking little in return. Michael De Santa Michael is a retired bank robber, living under the protection of the FIB witness protection program. With his money running out, he is being drawn back into a life of crime. Trevor Philips Trevor is an emotionally unstable, sociopathic career criminal, suffering from drug addiction. He has previously worked with Michael in various heists, and has prior experience as a military pilot, allowing him to operate aircraft. Franklin Clinton Franklin is "fit and fashion conscious", working for an Armenian luxury car dealer, repossessing cars of those who default on their payments. He is starting to work his way up in the criminal world. Grand Theft Auto V is set in the fictional state of San Andreas: consisting of the city of Los Santos and the rural Blaine County, which also includes two towns called Paleto Bay and Sandy Shores. The player can explore the entire map from the beginning of the game, although certain areas (Fort Zancudo, Los Santos International Airport and Bolingbroke Penitentiary), result in a wanted level being given to the player. GTA V also includes a fully explorable ocean floor, which can be explored by swimming underwater, scuba diving or in a submarine. Animals also roam across Blaine County and the surrounding Pacific Ocean with some (such as mountain lions and sharks) being prepared to hunt and kill the player character. Grand Theft Auto V was official announced by Rockstar Games in November 2011 with the release of the first first trailer, while retail posters released in October 2012 confirmed a Spring 2013 release for the Xbox 360 and the PlayStation 3, which was later confirmed by Rockstar Games. 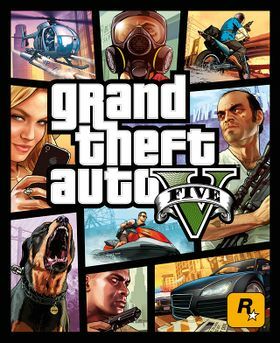 In November 2012 Rockstar Games announced that the game was available for pre-order and three days later a twenty-three page preview is released revealing the first real information about the game, including the scale of the games map and the inclusion of three playable characters. On Novembver 14th the second trailer was released. January 2013 saw Rockstar Games announce that the release date for GTA V had been pushed back. On April 30th three new protagonist based trailers were released. Both weapons and cars will be "very customizable"
One week later an official gameplay trailer was released and The Official trailer followed on August 29th. GTA V is set in 2013 shortly after the events of Grand Theft Auto Online, four years on from Grand Theft Auto: Chinatown Wars, and five years on from Grand Theft Auto IV, The Lost and Damned and The Ballad of Gay Tony. The game follows three protagonists on their individual journeys to success in the criminal underworld. Michael De Santa: In 2004 Michael De Santa, then known as Michael Townley, makes an off the books deal with FIB agent Dave Norton to retire from criminal activity in return for the arrests of Trevor Philips, who escapes, and Bradley Snider, who Norton killed. Michael, spending his days relaxing and arguing with his family, eventually returns to criminal activity after meeting Franklin Clinton. Franklin Clinton: Franklin Clinton is a gang member attempting to move to a more lucrative type of activity, legal or otherwise. He works as a repossession agent alongside friend Lamar Davis and lives with his Aunt Denise in Strawberry, Los Santos. Trevor Philips: Trevor Philips, believing his friend had been killed in 2004, became involved in numerous types of criminal activity and is looking to expand his operations. Trevor lives in Sandy Shores, Blaine County. The game begins in 2004 with an attempted heist on a business in Ludendorff, North Yankton by Michael Townley, Trevor Philips, Bradley Snider and an unnamed getaway driver. They manage to get away from the building with the money, however, the getaway driver and Bradley are killed, while Michael is also shot. Trevor flees the scene, which is filled with the local police and FIB agents, evading them. In between 2004 and 2013 Snider is buried as Michael, who moves to Los Santos to retire from criminal activity, while Trevor eventually finds his way to living in Sandy Shores, Blaine County just north of Los Santos. Following the opening mission set in 2004, the game begins in earnest with Franklin Clinton and Lamar Davis working at Premium Deluxe Motorsport for Simeon Yetarian as repossession agents. Simeon, having sold a car to Michael's son Jimmy, sends Franklin to repossess the car after he defaults on the payments. Michael, however, holds Franklin at gun point and forces him to drive the car into Premium Deluxe Motorsport's showroom. Franklin and Lamar, who had also kept a motorcycle rather than returning it, are both fired. Michael, feeling bad for Franklin, offers him a free beer and the two begin to talk about their involvement in the criminal underworld, both past and present. Michael, having seen his wife Amanda cheating with her tennis coach, chases him to a house before pulling the support beams from underneath it, destroying the house. Martin Madrazo, the home's owner, convinces Michael and Franklin, who had assisted Michael, into paying for the house to be rebuilt. The two form a crew and rob a jewelery store, taking enough money to repay Madrazo. In Blaine County, at the same time, Trevor Philips begins to expand his criminal empire by destroying The Lost Brotherhood's Los Santos chapter while also attempting to form links with the Triads, although this proves unsuccessful, which includes destroying a rival meth lab owned by the O'Neil Brothers. News of the jewellery store heist appears on news programs and a phrase used during the heist reminds Trevor of his lost friend Michael. He sends Wade Hebert to Los Santos to discover the whereabouts of Michael and eventually tracks him down. The two confront each other but work together to stop Michael's daughter Tracey from appearing on a reality television show. Michael, Franklin and Trevor then begin to work together to achieve their aims of earning enough money to live out their lives, while also attempting to keep FIB agents Steve Haines, Dave Norton and Andreas Sanchez from arresting or killing them. Together they steal military hardware, 'recover' a man from the IAA with information about a terrorist and perform a heist at a [[Paleto Bay]-based bank, although Michael and Trevor briefly go into hiding after kidnapping Patricia Madrazo. Trevor also spends this time piecing together the events of 2004 and brings his suspicions to Michael who is unable to successfully deny the truth. Michael and Trevor, having planned to perform one last heist, go their separate ways with Trevor promising to return and kill Michael. Michael and Franklin, however, continue to work together by perform a terrorist attack on the FIB building, with the promise of being set free from their work with the FIB corrupt agents. They, however, double cross the group and plan another meeting, which is subsequently raided by FIB agents after having received information from Andreas Sanchez. Steve Haines escapes and leaves his partner Dave Norton behind. Norton, however, also escapes with help from Michael and Trevor, who agree to put their differences aside to work on one last heist. Michael, Franklin and Trevor prepare for and then execute the heist, getting away with a vast sum of gold, which is later melted down and sold by Lester Crest. The crew gets its agreed share and the relationship between Michael, Franklin and Trevor ends. However, unknown to Michael and Trevor, Franklin had been contacted by the FIB to kill Trevor and by Devin Weston, a businessman and billionaire the trio had stolen cars for, to kill Michael. Killing Michael: If the player kills Michael, then he and Franklin will drive to a secluded spot before Michael is pushed off a water tower. Franklin can then either let him fall to his death or attempt to save him, causing Michael to headbutt him and fall to his death. Killing Trevor: If the player kills Trevor, then Michael and Franklin will chase him to an oil plant where Trevor will crash his car into an oil tank, covering him with oil, which Franklin lights on fire. Saving both: If the player decides to save both Michael and Trevor then the three work together one final time to attack FIB agents and Merryweather mercenaries before agreeing to split up and kill their various enemies. Michael agrees to kill Stretch, who had tried to get Franklin and Lamar killed on numerous occasions, Franklin agrees to kill Triad boss Wei Cheng, who had almost had a business relationship with Trevor and who had almost killed Michael, while Trevor is left to kill Steve Haines. Afterwards Trevor kidnaps Devin Weston and locks him in the boot Devin's car, which is driven to a secluded location and pushed into the Pacific Ocean by the trio. With Trevor and Michael reconciling, the three agree to remain friends, but end their relationships professionally. Grand Theft Auto V was commercially successful within twenty-four hours of release having generated $800 million, equating to 13 million copies being sold, and set a new record for first-day sales. Three days after released, on September 20th, 2013, the game exceeded $1 billion, making it the fastest selling entertainment product in history. Six days after release, September 26, 2013, GTA V had become the UK's fastest selling game of all time and the 24th biggest-selling game ever. The mission By the Book generated significant controversy regarding its use of torture on Mr. K in order to extract information about an Azerbaijani terrorist. Trevor Philips uses various torture devices on Mr. K, who is strapped to a chair. Trevor is later asked by corrupt FIB agent Steve Haines to kill Mr. K but instead drives him to the airport and while driving to the airport Trevor comments on the ineffectiveness of torture in extracting information. Community:GTA V Wishlist - the Grand Theft Wiki Community's suggestions on what should be included in GTA V.
This page was last modified on 28 June 2018, at 14:21.